Jackie Robinson Romito Figurine! Limited to a World-Wide Edition of Only 1,000, This Historic Figurine Was Produced to Honor the 50th Year Annversary of Jackie Robinson Breaking the Color Barrier! This is one of our own. Licensed by Major League Baseball since 1995, Romito, Inc. has produced some of the most limited and attractive baseball figurines ever made. 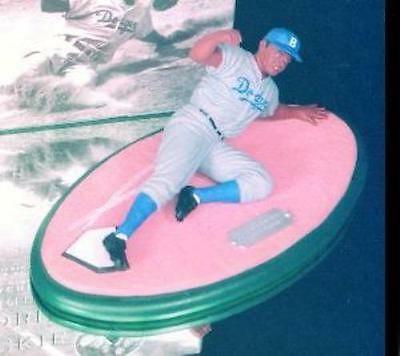 This Romito figurine portrays Jackie Robinson stealing home in the 1955 World Series. Limited to a World-Wide Edition Size of only 1,000 made, this figurine features the dare, courage and excitement that was Jackie Robinson. Robinson is depicted sliding into home, cracking home plate with the winning run, complete with a white home plate with cracks in it! It has the usual first class Romito features such as green felt and gold medallion on the bottom side of the base, tremendous quality in the base and a first class certificate summarizing Jackie's career. It is part of our Hall of Fame Series. Own it today! Check out our other auctions for Romito figurines! Here's your chance to own our figurine at almost 1/2 of the wholesale price of $85. Don't delay before we raise our price back up to the SRP of $170!